Last week I mentioned doing a video. I really, really tried but it did not happen. (1) I couldn't find my tripod, (2) no one was home to help me because I needed both my hands and (3) I couldn't stack enough miscellaneous items to hold the camera in the right place. The entire process of trying to make it happen had me laughing at myself, out loud. So, here is my labor of love, for my niece, who is graduating from high school today. It's my first money cake. I did take pictures of the process, so maybe I'll come back and post those soon. I know Father's Day has come and gone, but I needed to deliver the goods before I could post. 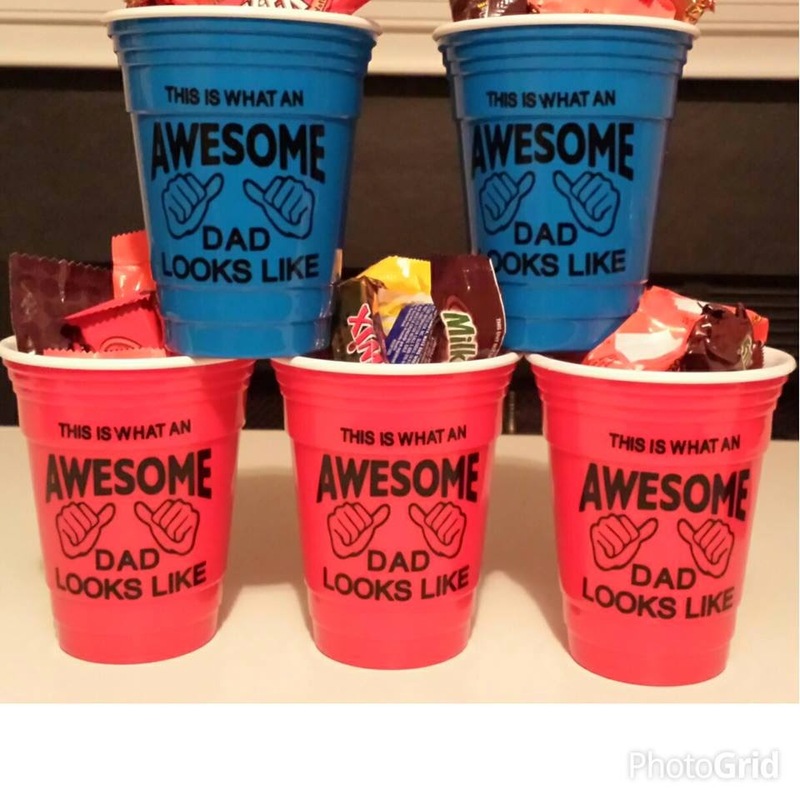 First, candy filled, 16oz reusable party cups. Names are on the opposite side of the cup. We had a nice Father's Day celebration at church on Saturday. 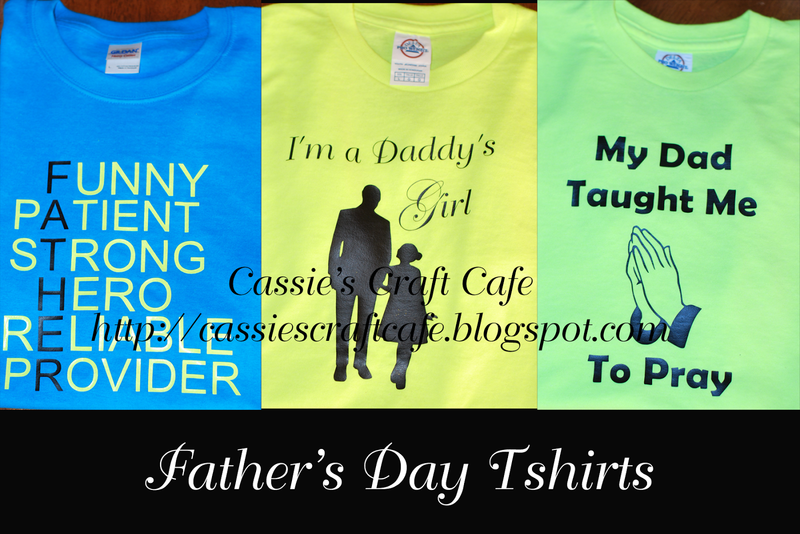 I was asked to make shirts for some of the children, who would be helping work. Including my baby girl, who is a fish frying machine! I know it has been a few weeks since my last post. Following my May celebrations (Craft Retreat, Mother's Day, Birthday, Memorial Day, Anniversary & two events ), comes the end of the school year. Why is it always jammed pack for my children? T minus a few hours and summer break can officially begin!!!! I have plenty of projects in the works but they can't be revealed until the recipient has it in tow. Last year, my daughter participated in a mentoring program at school. It was her first year there and I thought it was a great way for her to make friends. I attended almost all of the after school sessions with her and even taught a few. I wanted to make the teacher something nice to remember the girls by. It was a little challenging since the teacher is a male. Yes... it took an entire year to get to his project. Better late than never! Step 1: Gather Supplies: 11x14 frame (Michaels Arts & Crafts), acrylic paint, foam brush, newspaper, scrapbook paper and any embellishments you want to add. ﻿Step 2: Paint the front and back of the frame. I left the middle untouched because (1) painting is not a strength of mine yet and (2) the frame is going to be covered by paper. No need to waste paint. I've had my eyes on the various styles frames for a while now. I just needed an excuse to buy one. LOL!! Thanks for stopping by and taking the time to leave me a comment. I miss doing videos. I'm trying something new to me this weekend and hope to film it. Stay tuned. Have a GREAT day & WONDERFUL weekend! !